Gain a foothold in the healthcare industry with a UK Master degree in Health Science. Speaker : Dr Wong Sin Yew Infectious Diseases Specialist Gleneagles Medical Centre Speaker Profile : Dr Wong’s clinic at Gleneagles Medical Centre is the first private specialist clinic in Singapore to have met the standards to be awarded JCI accreditation as an ambulatory care centre. Dr Wong was previously Head, Department of Infectious Diseases at Tan Tock Seng Hospital and Clinical Director, Communicable Disease Centre. Read more/RSVP : http://bit.ly/1eiD5um About NORTHUMBRIA UNIVERSITY, UK : Northumbria University, in Newcastle upon Tyne, is an expanding multicultural learning community, with excellent links with other higher education institutions, industry and commerce throughout the UK, Europe and beyond. - Ranked 58th by The Guardian University Guide 2014 : University League Table - Northumbria University is a top ten choice for students beyond the European Union. 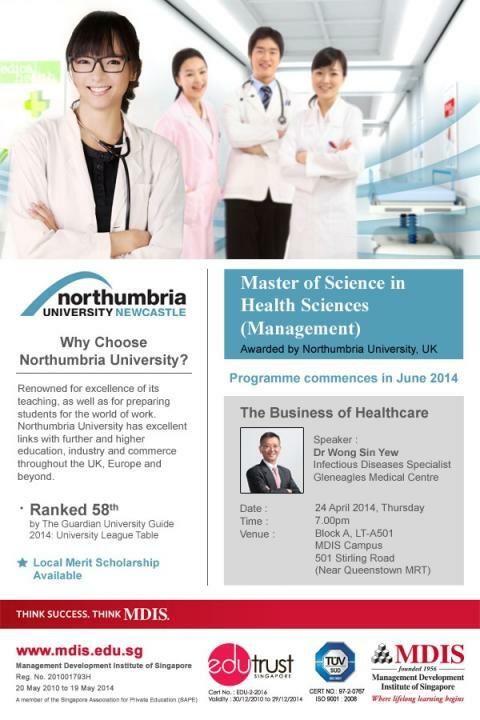 - In taught postgraduate education, Northumbria University is one of the UK's ten biggest providers. Renowned for the excellence of its teaching, as well as for preparing students for the world of work, Northumbria University also provides research opportunities for professional reflective practice.